then click on red icons. Order took 7 days to arrive, SMS progress updates, delivery by Amtrak. Well made, cables/batteries supplied, no manual, single instruction sheet. Supanet ISP, home, email and search (Ask Jeeves). Hack code fk39x39662 . Functionally similar to IBX101, same CPU & modem speed, 40-bit SSL. Picture shake during page load, RGB colour a bit washed-out. 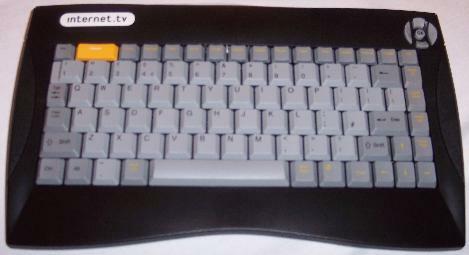 Large K/B (KB200), poorly marked function keys, no mouse, no on-screen arrow. Works ok with small k/b, mouse appears and works ok.
IBX202 has narrow i/r receiving angle. So both types of k/b must be directly in front of unit, and point at it. Large K/B works with IBX101 at any angle, but no mouse of course. So IBX202/KB200 combo ok on a table, no good for lounge furniture/floor use. Remove casing top (4 screws), remove front escutcheon (4 screws). Remove IBX202 sensor lens (to the right of the LEDs), and leave it out. Bore out plastic escutcheon to about 1 inch diameter, centred where lens was. Re-assemble. Your combo is now nearly as super-sensitive as IBX100/101. It does work, takes less than 1 hour, but on your own head be it. Scart in, scart out plus printer sockets. 2 front LEDs - one is bi-colour. 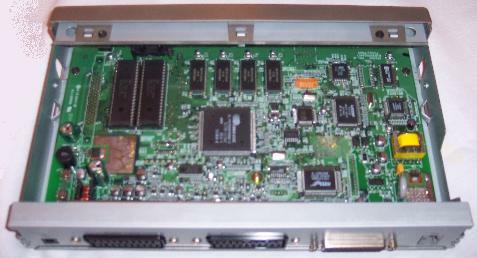 Single circuit board, soldered ram, socket rom, good scart control over tv. REM, £9 including delivery, don't look gift horse in mouth! Nov 06, my ISP now Fast4, unrestricted, £8/month, DNSs 213.130.128.32/3, ok on Bush boxes. Dec 07, still with fast4 & ok with their service. Some problematic connect failures and some line-drops. Very slow browsing sometimes, 15 minute inactive time-outs kick in ok. Most connect attempts take a while and need a fair amount of free memory on BushBoxes, seems like a download takes place. Note, fair number of outages of around an hour.